The sample is 10 cm x 12 cm. Medium brown, very sharp, Spinel-twinned Sphalerite occurs with needle-like Quartz and altered Chalcopyrite on a tan coloured matrix. 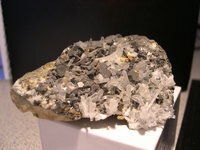 The Chalcopyrite has a metallic, granular coating on the crystals that may be the "Stannite-like mineral" described in the Mineralogical Record article on the pseudomorphs from Peru.